Parma is a beautiful old city. Before we went to Italy all we knew is that Parma is the source of Parmesan cheese and Parma ham. We discovered a busy and appealing city with a very long history and a collection of fine old buildings. Parma dates from 183 BCE. An earlier Celtic settlement existed in the same place. It’s small and easy to explore because the center is laid out in a grid pattern which is unusual for a city this old. It has many glorious churches and palaces. Today it is a rich and proud small city, one of the most prosperous in Italy. 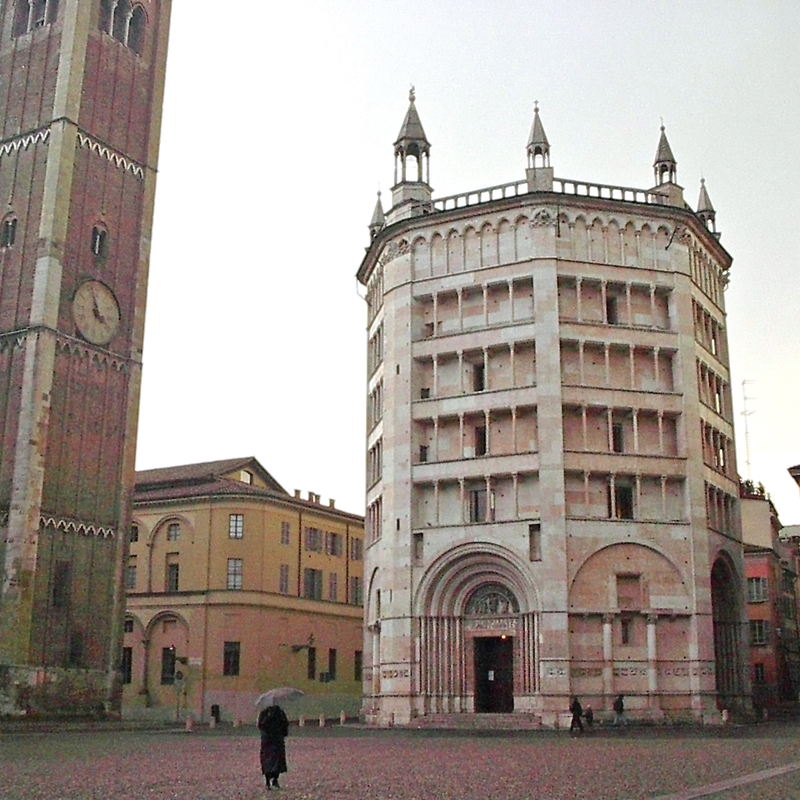 The Baptistery stands alone to the right of the cathedral and its tower. In medieval times only baptized persons were allowed to enter Italian churches causing baptisteries to be adjacent to churches. 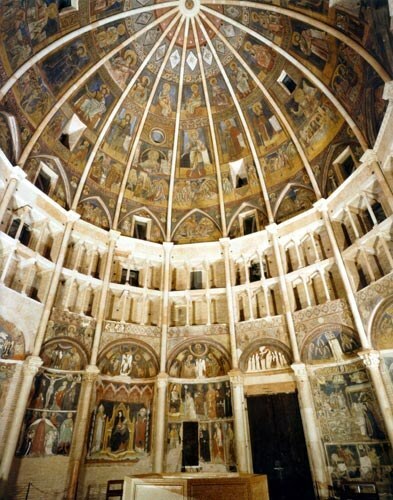 Parma’s most notable structure is the Baptistery at the cathedral, called “the most perfect medieval structure in Europe” by every book I’ve got, a building which illustrates the change from Romanesque to Gothic architecture. It is seven stories high, octagonal, made of pink marble. The exterior carving is very fine and the signs of the zodiac run in a band around the outside. This doorway is 800 years old. The skill of medieval sculptures, working only with primitive tools, astonishes me. 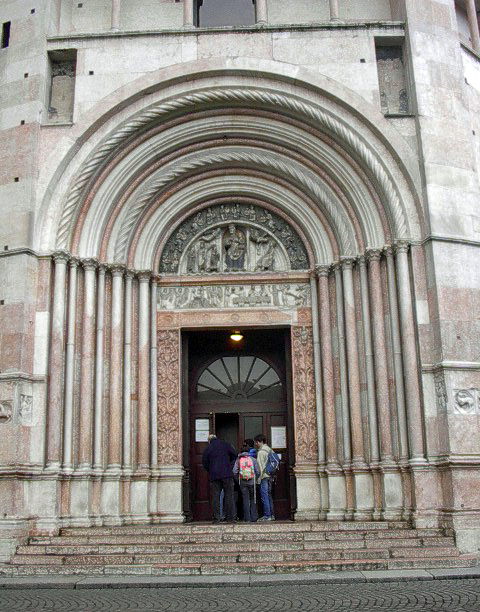 The “tympanum” is the carved half-circle piece above the door. Scenes from the life of Christ and other Biblical views are carved around the three exterior doors. Each of them has an exquisite tympanum, two of which still have some of their original paint. The extraordinary interior of the Baptistery. It is the inside of the Baptistery which is spectacular. Sixteen “rays” made from stone extend from the floor seven stories to the roof. 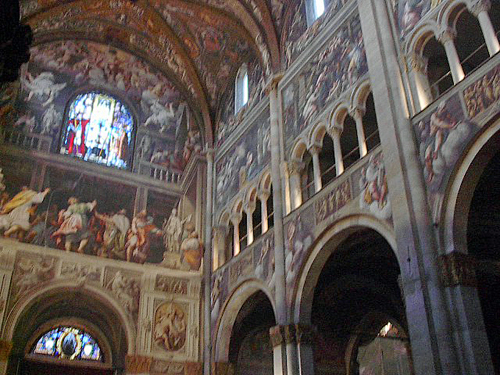 The interior is entirely covered in beautiful, bright frescoes, originally created by famous native artists of Parma. This building dates from around 1250 AD. Think about how difficult it must have been to design, to construct and the paint. One view of the interior of the cathedral, with apologies for the poor quality of this old photograph. 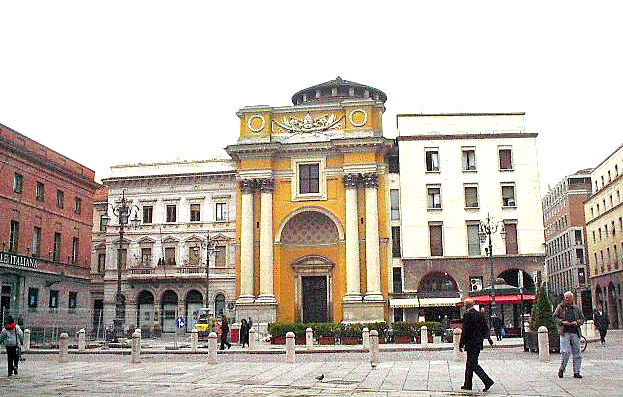 The Parma cathedral is beside the Baptistery. A purely Romanesque cathedral built in the 12th century, small looking from outside but feeling huge and deep inside. It too is made of pink marble and is covered inside in floor to ceiling frescoes. The nave is smallish but serves almost as an ante-chamber to the altar which is raised and is reached by many marble stairs. Side altars on either side of the main altar add more richness and beauty. There is a tall bell tower from the 14th century standing beside the cathedral, slightly tilting. 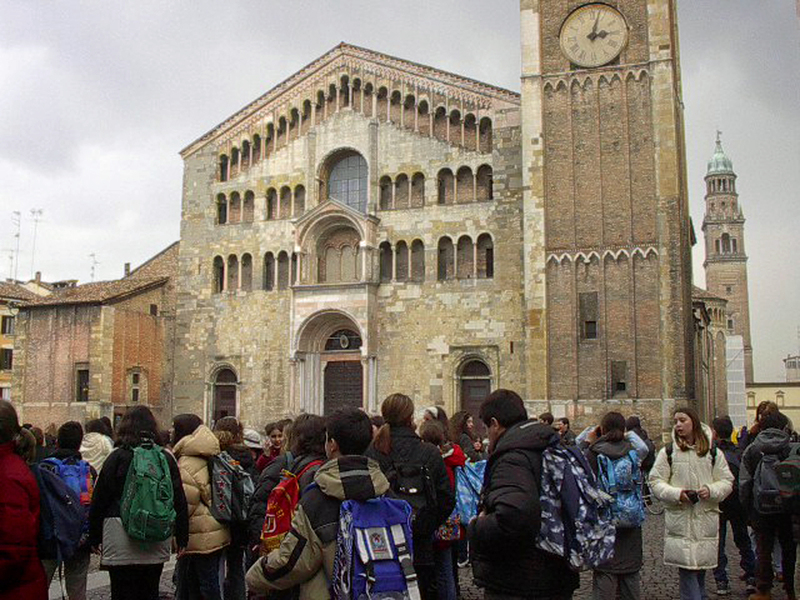 Some of the kids who visited Parma shown in front of the 12th century cathedral. During our visit to the Baptistery a large group of school kids came in. They were part of a larger group, probably a hundred and fifty or more. Kids are the same everywhere – funny, cute and noisy. They were getting their art lessons with the icons and items in the churches as teaching aids. Few of them will remember much of it for long I suppose, but how great it must be to grow up among all this beauty and history and art. The government building in the center of Parma was a palace many years ago. Note the sundial beneath the clock. 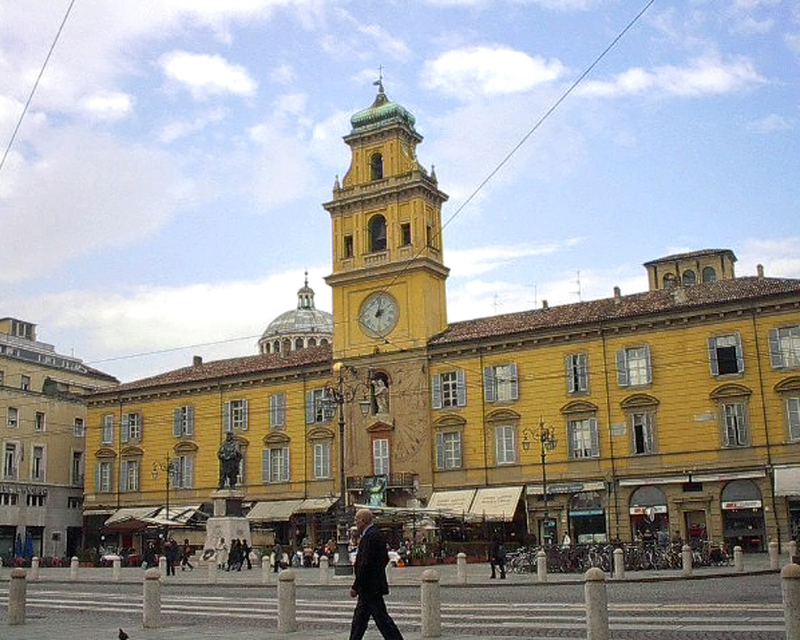 Today’s city center is focused on a large, bright yellow building with a massive clock tower on top known as the Palazzo del Governatore, once the palace of governors and princes. The city streets are lined with upscale shops and fine restaurants. A narrow river runs through the center of the city, crossed by five classic bridges. This picture makes you wonder who thought the building on the right was a good idea, doesn’t it? 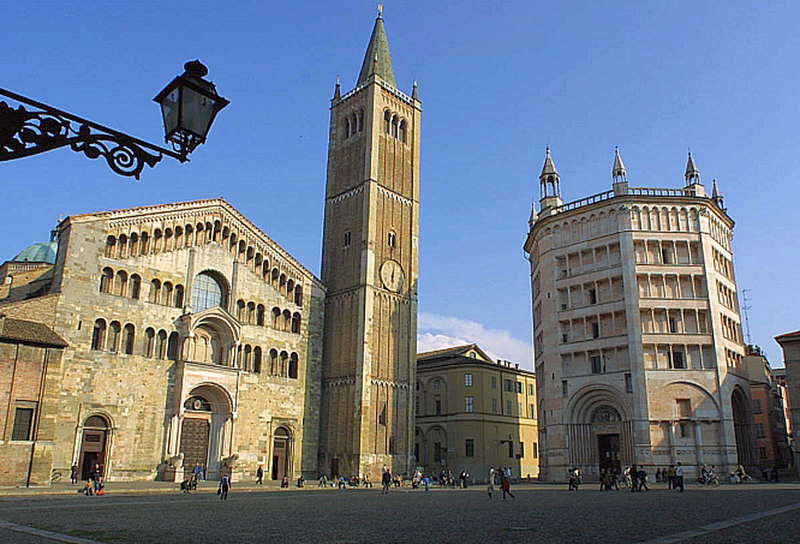 Parma has many historic sites to explore. There’s a five-pointed “cittadella” (fortress). The “Parco Ducale” is an enormous park and garden open to visitors today It was originally part of the Farnese-built ducal palace. This small city requires several days to fully enjoy, but taking your camera and your taste buds there for a night or two will keep you busy. The Cathedral: Wikipedia’s page is found here. The official webpage for the cathedral, in English, is very detailed. Find it here. The Baptistery – click the blue text for the link. The Parma tourism office has a very complete site here. This entry was posted in Italy and tagged Italy, Parma by Libbie Griffin. Bookmark the permalink.